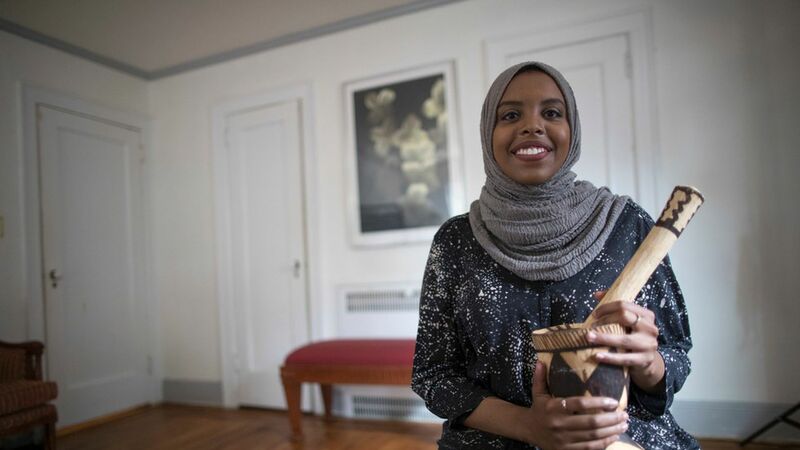 Eiman Ali, of Somalia and born in Yemen, poses for a portrait during an interview in one of the bedrooms of President Donald Trump's boyhood home in the Jamaica Estates neighborhood of the Queens borough of New York. On Saturday, the international anti-poverty organization Oxfam rented out Donald Trump's childhood home in New York City, (it's on Airbnb for $725 a night) and hosted four refugees who told their stories to reporters also invited there. This was planned to draw attention to the refugee crisis, with Trump at the U.N. this week. When asked what he would say to Donald Trump, Ghassan al-Chahada, a Syrian refugee, told NBC News, "I would advise him to remember, to think about how he felt when he slept in this bedroom. If he can stay in tune with who he was as a child, the compassion children have and the mercy, I would say he's a great person." Go Deeper: With more stories from the refugees.